Buying an above ground pool is a big deal. Not big like purchasing your first car or your first home big, but it is certainly big in what it provides for your family. For most families, a swimming pool is more than just a luxury expense. Pools are a source of fun and memories and it becomes the perfect backdrop for family parties. Most retailers are more focused on the business end (making money) rather than making sure the customer is proud of their purchase. If there is one thing that INYO Pools hopes you never experience, it is buyer’s remorse. If your family is ready to purchase an above ground pool, we highly recommend reviewing the 6 steps. Going over them with your family can be fun and entertaining. (Disclaimer: Even if you are not ready to purchase a pool just yet, keep on reading. 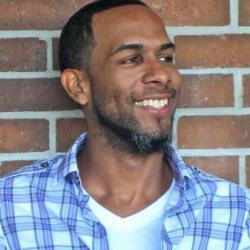 Reviewing the steps allows you to prepare mentally for when you can make the purchase.) Let’s get started. At first glance, this step may seem like a given. Of course you have to choose your pool, right? However, there are a lot of things to consider before you’re purchasing the pool besides how pretty it is. (Although that can definitely play a large role in the decision.) Still, you also need to consider the shape, depth, size, and the frame style of your pool. How big your yard is and your local codes may play a large role in which pool you can purchase. Let’s dig a little deeper. Depending on the size of your back yard and the regulations placed by your local ordinances on above ground pools, you have to decide whether a round or oval pool is most appropriate for your set up. In some cases we come across, customers lean more towards the oval shape because they assume it is bigger. However, again, depending on the size of your back yard, the round pool may still be more logical. 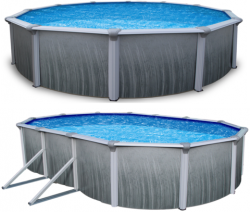 For example, a 24′ round pool holds more water water than a 15′ x 30′ oval pool, but the round pool is priced much less. The oval is priced more because it has more parts that hold it together so it doesn’t collapse from water pressure. If aesthetics plays a major role in your selection, when you build a deck with an oval pool it closely resembles an inground pool. Many families prefer this look over a traditional round pool. In the end though, it really depends on what you want and need from your pool. How deep do your want your pool? Typically, most above ground pools come in 48″, 52″, and 54″ walls, with 54″ being the tallest. Sizes depend on the model, though. The deeper your pool is, the more gallons of water your pool will hold. You may want to consider who will be using the pool the most and for what purpose. Some families use the pool for their smaller children and therefore prefer the shorter wall sizes. While some like to build a “deep end” in their pool and therefore prefer the tallest wall. It all boils down to your personal needs and preferences. For above ground pools, size does matter. And by size I am definitely referring to the size of your backyard. Before making a purchase, we recommend you researching your local pool ordinances. I know most areas have restrictions on the space that is left between your pool and the surrounding structures. You do not want to purchase a pool only to return it after your installer advises it goes against local codes and he cannot install it. Please do not take the size of your pool lightly. The last thing you need to consider about the pool before making a purchase is the frame style. 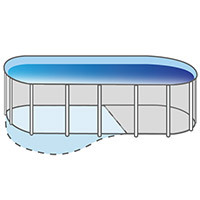 The frame of your pool includes the top ledges, uprights, bottom rails, and plates. Above ground pools are typically made of steel, resin, aluminum, or a hybrid of two. What exactly are the differences? Steel: When above ground pools were popularized, steel walls were the most prominent. They are the least expensive and heaviest of all the materials. Although technically steel is rust-resistant, it can corrode and oxidize at a much quicker pace once they are exposed to constant sunlight and saltwater. Resin: For the most part, resin is used as one component on an above ground pool, but in some cases it may be used for the entire pool. Resin won’t rust, corrode, or oxidize like steel does. It is more expensive, though. Resin holds up quite well to both water and the elements. It will not get as hot in the sun like a steel pool would. To me, the extra costs on a resin pool is worth it if you plan on having your pool for a long time. Hybrid: A hybrid pool is one that is made of both resin and steel components. Typically, the parts exposed to water are made from resin while steel is used for those parts that provide the most support. However, each hybrid pool may be different, so make sure you read the specs to determine which parts will be made which each. The combination of the two makes hybrids the best of both worlds. The concept of a pool liner is simple-it protects the floor and walls of your pool. One of the main purposes of a pool liner is to extend the life of your pool by preventing damage from occurring to the pool itself. Pool liners are very important to the overall aesthetics of your pool, but also or more importantly, it’s really what’s holding your water in place. Think about it. If you get a hole somewhere in your liner, your pool will begin to leak. Depending on where the leak is, you may not even notice is right away. The water, unbeknownst to you, is now leaking on your steel uprights.Over time, the water will cause the steel to deteriorate and force you to replace parts earlier than you should. In short, your liner is very important. There are 4 types of liners. Do you know them? Keep reading because one liner may be more appropriate for your pool setting. 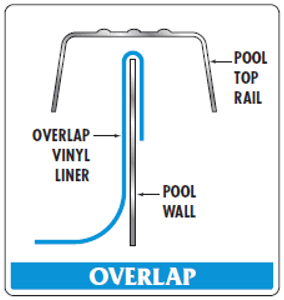 Overlap– An overlap liner is exactly that, one that overlaps over your pool. They attach to your pool wall with coping strips and the excess simply hangs over the edge of your pool. I have heard that overlap liners with a pattern design can be difficult to install for this reason. It can be difficult to align the liner even so that the design is evenly set around the pool. 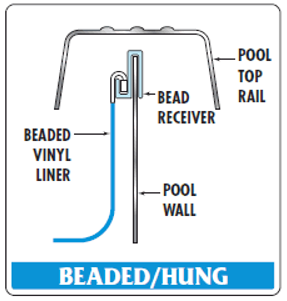 Beaded– Beaded liners have a thick bead of vinyl at the top of the liner that fits into a track installed to the top rails of your pool. In addition to your liner, you will also need to purchase a bead receiver that allows you to feed the beads into it. Because the liner does not fit all the way up the your top track, the chances of water getting between your liner and pool wall are high. And again, we know what happens when steel interacts with water. 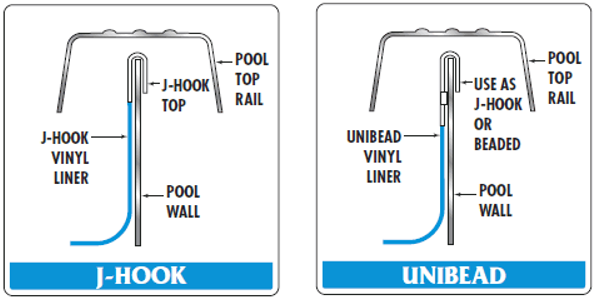 J-Hook/ Unibead– The J-hook, or unibead liner, is the most flexible of the three. J-hook liners have a thick piece of vinyl at the top that is shaped like a “U”. It is designed to attach or hook to the top of the wall so the rest of the liner hangs down. The unibead style, short for universal, has the same u- shaped piece of vinyl, but it also has a square of or triangular piece of vinyl under it. This allows the unibead to be used as either a J-hook or a beaded liner. Expandable– Expandable liners are just that- liners that are designed to expand to certain lengths or depths. If you intend to dig a deep end in your pool, this is the liner you need to go with. They can stretch to accommodate the deep end or deep center, and prevent you from having to purchase a bigger liner than what you originally expected. In most cases, they are designed for a 48″ or a 52″ wall and can expand up to 72″. After you have your pool and liner, the next thing you should focus on is the pump and filter system. Your pump and filter system, though not as expensive as the pool itself, is considered to be the heart of your pool. Your pump is what keeps the water inside your pool circulating. As the water circulates, it is pulled through and back out of your filter.Without this constant process, your pool water will remain stagnant, making it more of a cesspool than swimming pool. There are three different types of filters that you can choose from: Sand, Cartridge, or Diatomaceous Earth (DE). Depending on what part of the country you reside, some filter types may be more common than others. Are you familiar with any of these types? Which type of filter do you know the most about? Do you know the major differences? Let’s dig a little deeper. Sand filters are the most traditional style of filtering your pool. It’s been around the longest and is typically the type of filter most people have heard of. (Whether they use a sand or not, is a different story). Water is pushed by the pump through sand located inside the filter and is removed through a set of lateral tubes located towards the bottom of your filter tank. As the filter becomes clogged with debris from your pool, the pressure will increase on your filter and your water flow will decrease. This is an indication that your filter needs to be cleaned. To clean the filter, you will have to run it in reverse and dump the wastewater. This is what we call backwashing your filter. Typically, you have to backwash your filter every few weeks, depending on how dirty your pool water is. Once the sand becomes too dirty, it’s not difficult to replace. Sand filters are the least expensive option of the three, but it is also the one that requires a lot of maintenance. Backwashing your filter is fairly easy, but the excess water has to go somewhere, right? Additionally, sand filters are towards the bottom of the filtering pole because they only filter down to a particle size of 20-40 microns. Cartridge filters fall next in line right after sand filters. The concept of a cartridge filter is pretty simple. Water passes through a filter material located inside your filter tank. The cartridge element captures debris from the circulating water. They act very similar to the water filters you use under your sink. Cartridges have a larger available area to filter than sand filters and therefore can last a little longer before having to clean it than sand filters. On the flip side, cartridges are more expensive than sand to replace. Still, from a maintenance standpoint, it is a lot less work. Cartridge filters are designed to run at lower pressure than sand. This puts less pressure on the pump and as a result, you end up with better flow rates. Generally, the cartridges have to be cleaned once or twice a season, depending on the size of the cartridge and how dirty your pool water is. To clean them, you simply remove the cartridges from the tank and hose them down with a hose. You don’t have to worry about where to drain the excess water like you would for a sand filter. Another advantage is this type of filter does not require a multiport valve. Both sand and DE filters require multiport valves. Although a very handy tool, over time it can cause leaking and pressure issues. 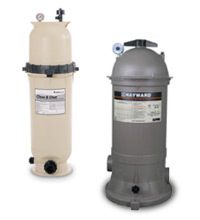 Cartridge filters can filter particles as small as 10-15 microns (compared to 20-40 for sand filters). D.E., or Diatomaceous Earth, filters use tiny fossilized exoskeletons of diatoms to filter out particles. Similar to cartridge filters, D.E. filters utilize grids located inside the filter tank that are coated with D.E. powder. The D.E. powder catches debris, like the sand filter does, but on a smaller scale. D.E. filters can filter particles as small as 5-10 microns. In comparison, D.E filters provide the overall best filtration for your pool. Although D.E. filters are great at filtering debris, the maintenance costs to keep your unit working are definitely higher than sand and cartridge filters. Replacement grids should be cleaned every few months and are more expensive than the cartridges or sand. Also, because D.E. powder is carcinogenic, there may be local codes that prevent you from backwashing your filter in drains. Although they are the best filtering option, the overall maintenance is greater. Remember when I said that without an operating pump, your water would get pretty dirty? Well, the second important step to maintaining a perfect pool after a working pump and filter is to sanitize your pool water properly. Sanitizers kill bacteria, prohibit algae blooms, and kill any other contaminants that you might not want to interact with. Chlorine is the most common and cost effective way to sanitize your pool, but there are other options for your pool. Today, you can choose to sanitize your pool with salt or mineral packs. Let’s take a look at the major differences. Chlorine tablets, which look like hockey pucks, are the most common form of chlorine used in swimming pools today. 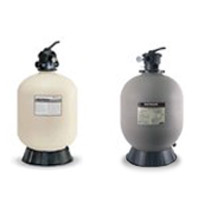 They usually come in one and three inch sizes and are used in conjunction with a chlorine feeder or floater. So, if you thought you simply toss the tablets in your pool the answer is no. One of my favorite ways to dispense chlorine is a chlorinator. A chlorinator is simply a chlorine dispenser that allows you to manually regulate the speed the tablets dissolve. If you have ever swam in a salt water pool before, you immediately feel the difference when you get back into a chlorine pool. It’s proven that salt pools are not as harsh on your skin, eyes, or clothes. Some even say salt pools are easier to maintain. Salt chlorine generators uses common salt (the same salt used in water conditioners) and converts it into “free” chlorine. The chlorine sanitizes your pool and then reverts back into salt. Will a Salt Chlorine Generator Rust My Above Ground Pool? Another alternative you have to chlorine are mineral packs. Mineral reservoirs contains a registered mineral formula and fits inside . The minerals continually replenish themselves for added protection against bacteria, as well as keeping your pool’s pH balanced by acting as a neutralizer. With minerals, chlorine use can be cut up to 50% over standard water treatment programs. This is a very convenient way of reducing chlorine use and hassle. One of the things that most pool buyers don’t think about until it’s time to swim is how they are going to get into and out of the pool. Most pools do not come with ladders or pool entry systems. They are typically purchased as an add-on item. Well, if there were any add-on items you should consider, it is a ladder for your above ground pool. Ladders are especially important if your children and their friends will be using the pool. There are several different swimming pool ladders for your above ground pool. The A-frame pool ladder is the more common of our ladders. The A-frame will allow entry into and out of your swimming pool. We also sell ladders that allow entrance just into your pool. This type of above ground pool step can be attached to your deck. Purchasing a ladder or pool entry system also helps preserve your pool parts as less stress is placed on these parts when getting in and out of the pool. Pool Cleaner: If I have a filter and a chlorinator, do I still need a pool cleaner? Is it absolutely necessary? To be honest, anything that is typically not offered in a pool package is not necessary for the operation of the pool. However, pool cleaners provide benefits and a certain level of convenience that pool owners need. Because pool filters will not remove debris, leaves, and any other large articles that may have fallen into the bottom of your pool, you will need to actually remove those objects. If you’re not a fan of manual labor, ie. using a pool net to remove the leaves, then a pool cleaner is the way to go. There are three different types of cleaners: Robotic, Pressure, and Suction. To read more about which cleaner may be the best for your pool set-up, please check the links below. Which Type of Automatic Cleaner Should I Use? Pool Lights: Pool lighting, though not necessary, helps bring your pool full circle. Pool lights set the ambiance and mood but they also provide additional security for swimmers at night. And who doesn’t enjoy a late night swim? Unlike inground pools where lights are installed in the wall, above ground pool lights have the ability to float or simply to hang over the top railing of your pool. 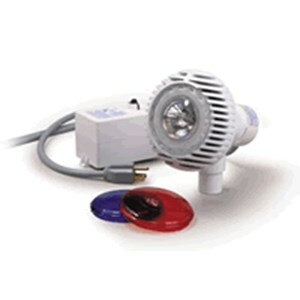 Above ground pool lights are easy to install and reasonably priced. Heaters: Heating your pool is a wise investment for your and your family. One of the major benefits of a heater is that it extends your swimming season. Without a heater, your pool season may end in August while a heater may extend it to November. (In some areas, a pool heater allows your to swim all year long). 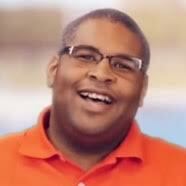 If you need help sizing the heater for your pool, give us a call and we’d be more than happy to assist you. As mentioned earlier in this blog post, purchasing an above ground pool is a big deal. Never feel rushed or obligated to purchase a pool you do not feel comfortable with. Above ground pool deliveries are large and take time which makes returning one, for the lack of better word, annoying. Before making a purchase, make sure you check off all the things you absolutely need for your pool. Make sure you have a licensed installer who is comfortable with above ground pool installations. Good information! You might consider adding some cost data for the type of pool or filter for example that you are discussing. Thank you! 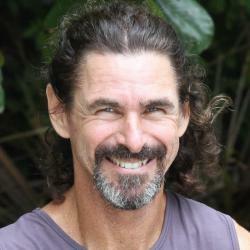 Very good, and mostly thorough information, although prices might help. 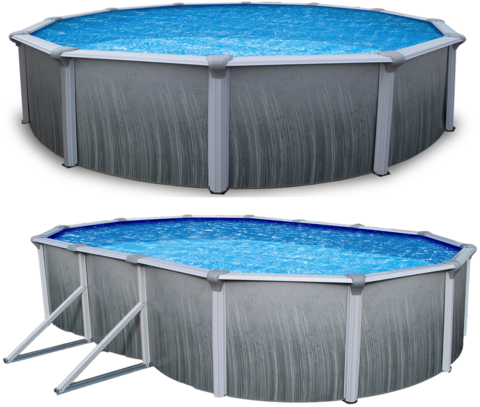 I desperately want a pool, but do not have more than maybe 5k to invest in one, so I was looking at spools or cocktail pools (just a tiny, plain pool) versus an above-ground one. For pricing, give our Above Ground pool section. 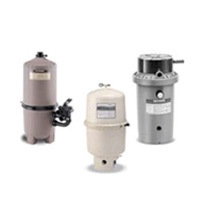 When you select the pool model that strikes your fancy, we provide a selection guide for pumps, filter, chlorinators and other accessories. Thank you for providing this valuable information free of charge and sales hassle! Thank you for the info, greatly appreciated. Thank you for all this information! It was very helpful. One thing to mention that I didn’t think about; you need to have an electric source. I have an appointment scheduled for electrician to tell me how much it will cost to run electric from the house to the pool. That might also help determine where you place the pool. You have a heavy bather load. I recommend a big pool. At least a 30′ round. A 33′ round would be even better.